“Above the clouds, everything’s pure, beautiful. Ever seen “Chariot“? It’s also a low-budget thriller taking place on an aircraft with a limited number of protagonists. 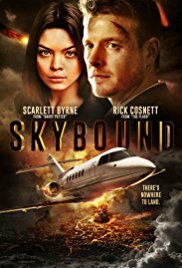 The difference with “Skybound” is that it took place on board of a much larger aircraft. But the main difference is the entertainment content and solidity of “Chariot” compared to the emptiness and the lack of inspiration in “Skybound“. Not only was the acting sometimes stiff, the conversations were occasionally laughably bad and you can not call it exciting either. But especially the improbabilities and completely ridiculous situations ensured that this otherwise well-cared-for movie ended up in a downward spiral, so that my appreciation also ended up in an arrow-fast nosedive. It started interesting but eventually it irritated me in such a way that I wished this luxurious airplane (Freedom XJ One. I’m sure this type doesn’t even exist) would really crash onto the surface of the earth. The opening scene shows Lisa (Scarlett Byrne) and her date Matt (Rick Cosnett) who are on their way to enjoy a nice weekend, together with a friendly couple. I suppose Lisa and Matt just met, since Matt immediately apologized for driving around in a very expensive car. That means Matt assumes that she doesn’t know he’s from a wealthy family. And apparently he’s also unaware of the fact that she knows his brother Kyle (Gavin Stenhouse). Well, wealthy sons have so little free time and therefore spend a minimum of time together, I suppose. Then Matt brings the joyful news that they fly to Malibu, along with Odin (Tyler Fayose) and girlfriend Roxy (Carla Carolina Pimental). And when it turns out that Kyle also has to fly along as co-pilot, you already know that this will be a turbulent flight. Next there’s also a stowaway on board who wasn’t only looking for food. And landing the plane later on isn’t so obvious either, since there is no landing spot to be detected on the surface of the earth. You thought “Snakes on a plane” was utter crappy and totally whacked. You’ll call it a true masterpiece after watching “Skybound“. Most of the low-budget films have poorer film quality and amateur-like acting. But in some cases it also has an ingenious, quirky story-line. Strangely enough, this low-budget film is the opposite. The used images aren’t that bad at all. The acting isn’t disastrous and the idiocy is more due to the choices made by the script writer. But it missed a tad of tension and an atmosphere of total despair. Also the story is as empty as a bottle of wine in the hands of an alcoholic and there are several events that are too stupid for words. It sometimes feels as if they did that deliberately though. For instance. To my surprise, a whole plane was demolished while the entrance door stood wide open and everyone walked calmly around as if it was plain normal. The given situation wouldn’t bother me, was it not that they already opened that same door to refresh the air in the plane while everybody was securely tightened. Because the pressure and wind could unintentionally catapult someone from the plane. Weird, not? And you think Monty Python is absurd. And there are a lot of other absurd, ridiculous situations. A perfectly round bullet wound and a bullet being removed perfectly lying flat. And then the amazing speed with which the wounded person recuperates from this wound. Plus the fact that a grown man still believes that the name Odin comes from an African God. One could argue that this is a reflection of the intellectual level of the entire film. But then there are suddenly intelligent statements about the “Traffic Alert and Collision Avoidance” system and the artificial pressure in an airplane. An airplane I’m not eager to take given the firmness with which engines are attached. And lets not forget the totally unlikely ending. Low-budget B-movies may not be popular, but there are still people who love an old-fashioned survival film that doesn’t take itself too seriously (including myself). There are probably more similar low-budget films dealing with an apocalyptic world end with similar stupid content. But most of the time the visual aspects in these films are also of a poorly low level. That’s also the most positive feature you can find in “Skybound“. The professional looking camera shots (besides the kitschy ice-letters in the clouds at the beginning) which sometimes are the same level as that of blockbusters with a million budget. “Skybound” is a negligible film that leaves no lasting impression. In other words, it certainly isn’t a high-flyer.